In the geopolitical hotspot of Azerbaijan any semblance of calm is welcomed. So the prosperity that the country's estimated $140 billion in oil revenues promises to generate and the Baku-Tbilisi-Ceyhan pipeline have dominated the headlines, trumping more serious discussions about this complex nation struggling to find its identity. Foreign investors, the international community and the Azerbaijan government itself have largely ignored worrying trends that threaten the country's future, preferring to maintain the status quo for fear of opening Pandora's box. But this important East-West crossroads is already squeezed by two conflicts -- in the north and south Caucasus -- that are being linked in order to amplify radical Islamist rhetoric. The struggle with Armenia over Nagorno-Karabakh has left Azerbaijan with more than 600,000 refugees and internally displaced persons, according to the United Nations. 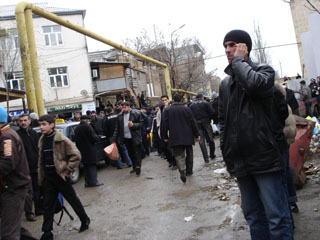 Meanwhile, the violence in Chechnya has brought in a small but active group of refugees, including radical Islamists. Azerbaijan is a nation uniquely vulnerable to external influences and the country has suffered an arguably greater identity crisis than other former Soviet republics. Azeris speak a Turkic language similar to that spoken in Turkey, a country whose trajectory they often hold up as a model for their future development. But, unlike the predominantly Sunni Turks, the Azeris are of Shiite origin � like the Islamic Republic of Iran, with which they share a border. In the northern regions, the ethnic Lezgins, who are Sunnis, have a natural affinity for their more radical Dagestani and Chechen brethren. How might these factors influence Azerbaijan's future? In the regions bordering Dagestan, Wahhabism, the radical Sunni sect that has inspired Osama Bin Laden, has spread rapidly. Wahhabi activities reached a critical point a few years ago when Azul Kasimov , a Dagestani and self-styled imam, declared himself to be the leader of all Lezgins, openly preaching for the creation of an Islamic state in the area. These are not simply the doings of a few diehard radicals. There are now 100 religious schools and Wahhabi mosques in Azerbaijan. Baku, until the late 1990s largely untouched by the influence of such groups, is now witnessing rapid growth in the numbers attending its main Wahhabi mosque, Abu Bakr, which currently draws 5,000 to 7,000 believers for Friday prayers. While Wahhabi activities originated as a spill-over from Chechnya, and have thus far been containable, there are strong indications these groups have grander designs. They are overtly critical of Western values, and use any dissatisfaction to feed anti-Western sentiment. The issue of Karabakh is essentially territorial rather than religious, but it is increasingly being couched in religious terms -- an obvious point of entry for radicals seeking influence. Armenia fought a war with Azerbaijan over Nagorno-Karabakh, a wedge of Azeri territory that both nations claim, and that features prominently in the mythologies of both peoples. Hostilities began in mid-1991. With the Soviet Union on the edge of collapse, both Armenia and Azerbaijan sought to re-establish their own right to self-determination and re-assert their ethnic identities. While it is easy to chalk up tensions to the divide between the Christian and Muslim worlds, this reading fails to explain the long periods of peaceful co-existence between the two communities. Indeed intermarriage was quite common, and business links were strong. Historically there have been flareups between the two communities, but these have been exacerbated by power politics in the region. A ceasefire was declared in May 1994, by which time some 25,000 lives were claimed and hundreds of thousands were forced to flee their homes. On the frontline between the Armenian occupied area and the rest of Azerbaijan there are still regular exchanges of fire. The Azeris consider it a slight to their growing sense of national pride that some 14% of the land, recognised by the UN as part of Azerbaijan, remains occupied. The combination of growing confidence and huge oil revenues, with money being diverted into the acquisition of military hardware, make this fragile ceasefire unsustainable. Within every social class and age group throughout Azerbaijan, genuine anger is brewing over Karabakh and people speak of sending their sons to fight The history of the conflict reveals atrocities on both sides. The Azeris focus on the events at Khojali (February 1992) in which Western media documented the slaughter of hundreds of civilians; whilst the Armenians refer to riots in Sumgayit in which members of the Armenian community were killed and many more driven from their homes in Feb 1988. The more cynical assert that the Azeri government lacks political will to solve the conflict, and is motivated by a need to keep the nation together, rallied against a common enemy. This oversimplification has become a commonplace obscuring the real problem -- the government's fear that any compromise on Karabakh will create dangerous unrest. This fear has prevented an opening of the debate with the people of Azerbaijan to explain the positive aspects of compromise ,the stability it would create in the region and the knock on effects this would have for Azerbaijan's future development and prosperity. The Minsk group created to effect a peace settlement (composed of Russia, US, and France) worked largely in secret until June 2006, when proposals for a phased plan to demilitarize the territory and to hold a referendum on its future were made public but not adequately debated. Instead the use of inflammatory rhetoric in the Azeri media has stirred up hatred and anger. Now that this has become the backdrop for discussions within Azerbaijan, many are looking for a clear victory, whatever the costs. Ironically it is the desire to keep the nation together that may tear it apart as radical elements in Azerbaijan use Karabakh to foment unrest. In the meantime, Armenia and Azerbaijan are prevented from having any contact, seeding prejudice on both sides. And this may condemn another generation to a round of bloodshed. As ever, it is then that violence will trigger the international community's interest just a little too late. Azeris live in the marchlands between great powers, and tend to believe that the solutions to Azerbaijan's problems in Karabakh will not be resolved without Western patronage. Whatever the realities, this means the anger generated by this frozen conflict is increasingly directed westwards. They blame western media for ignoring Karabakh, which has received almost no coverage, despite the strategic importance of the region. In Azerbaijan, growing ambivalence towards the West is not limited to Karabakh. Halting attempts at democracy and rampant corruption are also sources of grievance. Azeri democracy activists say their efforts are not adequately supported and the lack of debate is hampering the chance for peace. American foreign policy and grave concern for the effects military action in Iran might have on Azerbaijan (with more refugees flooding in) also strengthen anti-Western voices. Russia's motives are also viewed with suspicion by Azeris. Armenia is heavily dependent upon Russia -- and Russia's power in the region is augmented by this dependence. So they are not seen as honest brokers in the peace process. For Azerbaijan to find stability and peace, its progressive tendencies must be nurtured. A good place to start would be an opening of debate on the future of Karabakh. Azerbaijan is a small country but it can have a pivotal effect: With one foot in the West and one in the East it straddles a civilizational fault line. Will the country operate as a bridge between the two or as a chasm? The next few years will be critical to answering that question.